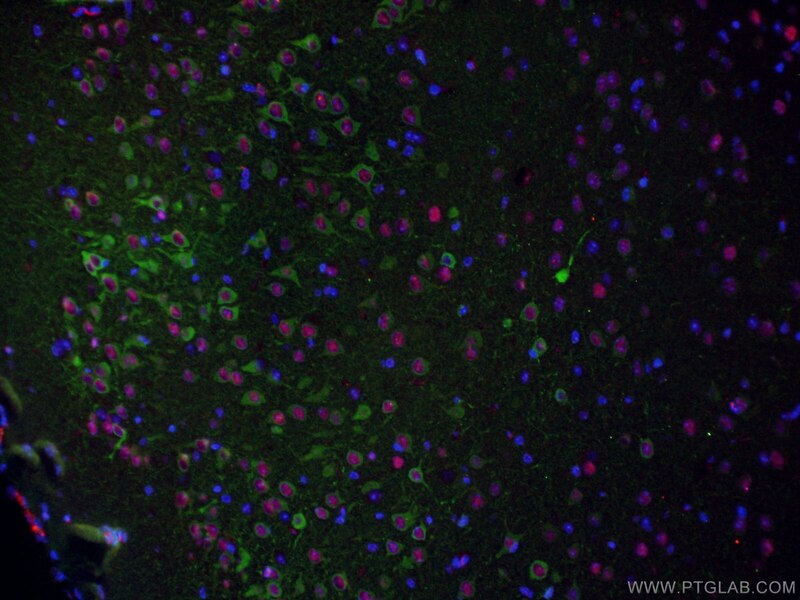 Immunohistochemical analysis of paraffin-embedded mouse brain tissue slide using 11558-1-AP (WFS1 antibody) at dilution of 1:1000 (under 10x lens) heat mediated antigen retrieved with Tris-EDTA buffer(pH9). 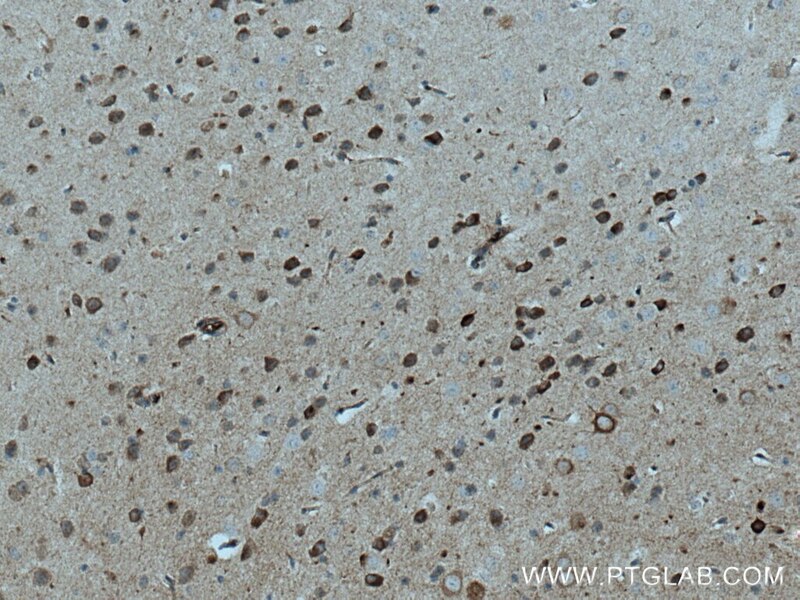 Immunohistochemical analysis of paraffin-embedded mouse brain tissue slide using 11558-1-AP (WFS1 antibody) at dilution of 1:1000 (under 40x lens) heat mediated antigen retrieved with Tris-EDTA buffer(pH9). 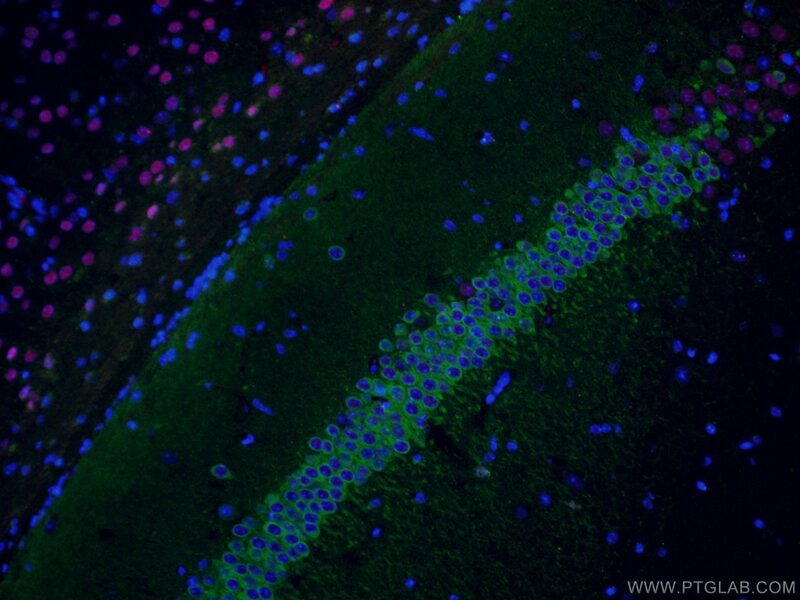 Immunofluorescent analysis of ( 4% PFA) fixed mouse brain tissue using 11558-1-AP (WFS1 antibody) at dilution of 1:50 and Alexa Fluor 488-Conjugated AffiniPure Goat Anti-Rabbit IgG(H+L). The section was co-stained with 66564-1-Ig (Tbr1 antibody) and and Alexa Fluor 594-Conjugated AffiniPure Goat Anti-Mouse IgG(H+L). Wolfram syndrome protein (WFS1), also called wolframin, is a transmembrane protein, which is located primarily in the endoplasmic reticulum and its expression is induced in response to ER stress, partially through transcriptional activation. ER localization suggests that WFS1 protein has physiological functions in membrane trafficking, secretion, processing and/or regulation of ER calcium homeostasis. 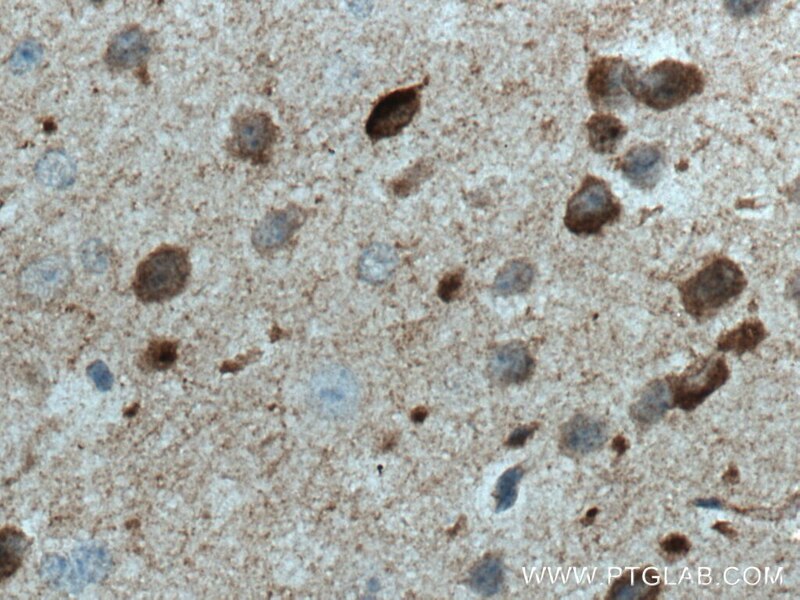 It is ubiquitously expressed with highest levels in brain, pancreas, heart, and insulinoma beta-cell lines. Mutations of the WFS1 gene are responsible for two hereditary diseases, autosomal recessive Wolfram syndrome and autosomal dominant low frequency sensorineural hearing loss. A calcium-dependent protease as a potential therapeutic target for Wolfram syndrome. ATF6β regulates the Wfs1 gene and has a cell survival role in the ER stress response in pancreatic β-cells. Calcium efflux from the endoplasmic reticulum leads to β-cell death. IRE1 prevents endoplasmic reticulum membrane permeabilization and cell death under pathological conditions. Distinct speed dependence of entorhinal island and ocean cells, including respective grid cells. Entorhinal Cortical Ocean Cells Encode Specific Contexts and Drive Context-Specific Fear Memory.